Considering Michigan’s humid continental climate, filled with high amounts of precipitation, rain, and snowfall, the need for quality heating and cooling in Lansing is clear. Heavily impacted by the Great Lakes, Lansing’s cold winters can have heavy snowfall, while the summers reach high temps and humidity. With this, you need a quality heating and cooling service provider to ensure comfort in your home throughout the year. Fortunately, Applegate Home Comfort can do exactly that! With Applegate Home Comfort, you can rest assured knowing you’ll remain comfortable throughout Michigan’s changing seasons. Offering heating and cooling equipment in addition to repair services for both, Applegate is committed to ensuring complete customer satisfaction in every service we offer. Take a moment to learn more about our heating and cooling services and why they are so essential as a homeowner in Lansing, MI. Furnaces: Falling under central heating, gas and electric furnaces work by directing heated air through ducts throughout the home. Most homes in America utilize furnaces for heat. Heat Pumps: Also a type of central heating, heat pumps are often built underground outside the home, taking heat using an electrical system and pumping said heat into the home. Some heat pumps, however, use the outside air as the heat source. Hybrid Heating Systems: As the name suggests, hybrid heating systems are a combination or either air-source or ground-source heat pumps and furnaces—gas or propane. This type of heating system offers optimal efficiency. Of course, we can’t talk heating systems without talking heating repairs, and Applegate can help homeowners with both. 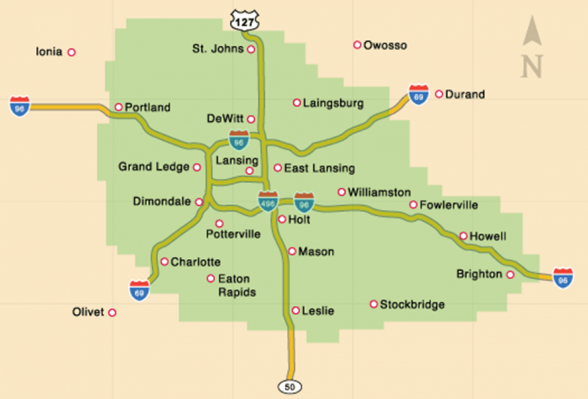 Whether you live in Lansing, DeWitt, or nearly any other mid-Michigan community, we can surely lend a hand in all your HVAC needs. Whether you need a simple maintenance or would like to completely replace your heating system, we can get the job done with quality care and efficient service. Though Michigan’s winters warrant heavy snowfall and cold temperatures, the summers, as you already know, are quite warm and humid. And while sweating is a great way to cool off, your home is still going to need an effective AC unit. Applegate’s home air conditioning service features the installation of our high-efficiency units, in addition to air conditioning repairs! When it comes down to it, having efficient heating and cooling services completed in your Michigan home will provide optimal comfort through the state’s harsh seasons. As mentioned, we offer our services to a broad range of locations throughout mid-Michigan, including Brighton, Holt, Howell, Webberville, and much more! Give Applegate Home Comfort a Call Today! No matter your HVAC needs, the experts at Applegate can help keep your home heated and cooled throughout Michigan’s changing seasons. Rain or snow, hot or cold, we strive to provide the best in home comfort. If you’re in need of our HVAC services, give us a call today at 517.337.7700. You can also contact us here.